We’ve already taken a fun hands-on look at the iCade for your iPad, but the same makers have decided to put a similar spin on a controller that’s a little more portable in nature. If you don’t want to house your iPad in a small arcade replica while you play classic Atari video games, the smaller iCade 8-bitty companion controller ($25) might be just your style. This wireless controller will work with your iPhone, iPad, or iPod touch and gives you the tactile feel of an old-school video game that works with your more modern tech life. 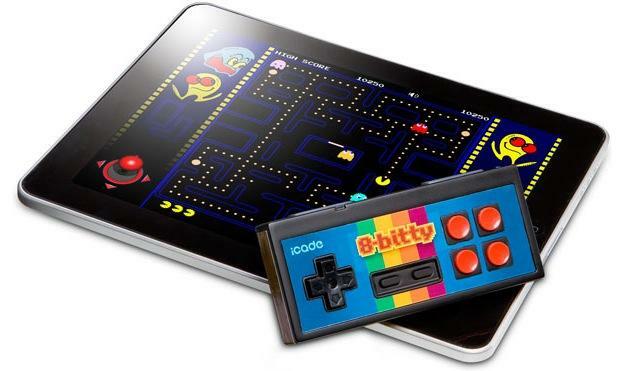 The 8-bitty offers a D-pad, eight buttons, a classic rectangular shape, and Bluetooth technology to let you easily connect the controller to any of your iOS devices. The iCade cabinet is a fun novelty, but it’s expensive and is destined to stay put on your desk or the coffee table in your man cave. Those two things held us back from raving about it, but we understand the need for more tactile controls on the iPad or iPhone when playing games. Repeatedly touching the screen of your iPad isn’t exactly the same as the familiar feel of an old-school controller. The 8-bitty beats the iCade out on both of those fronts thanks to its inexpensive price tag and the fact that it can easily slip into your back pocket to be used whenever you need a gaming fix. Combined with a gift card to buy the complete set of Atari retro games, the 8-bitty would make a great gift as well. It will be out later this year via ThinkGeek.